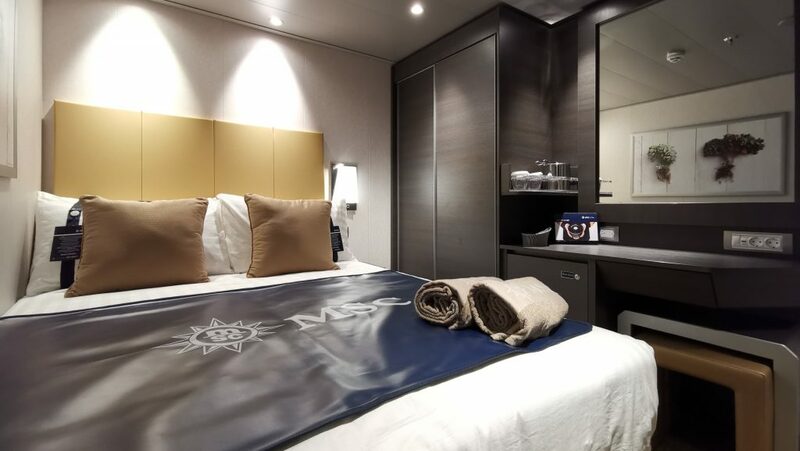 Cruising is choosing and with over 2,200 cabins in 10 different types, ranging from interior staterooms to ultra-deluxe suites, picking the right stateroom onboard MSC Bellissima can be quite tricky. To help you find the perfect cabin we explored some of the different staterooms on board #BeautyAtSea. 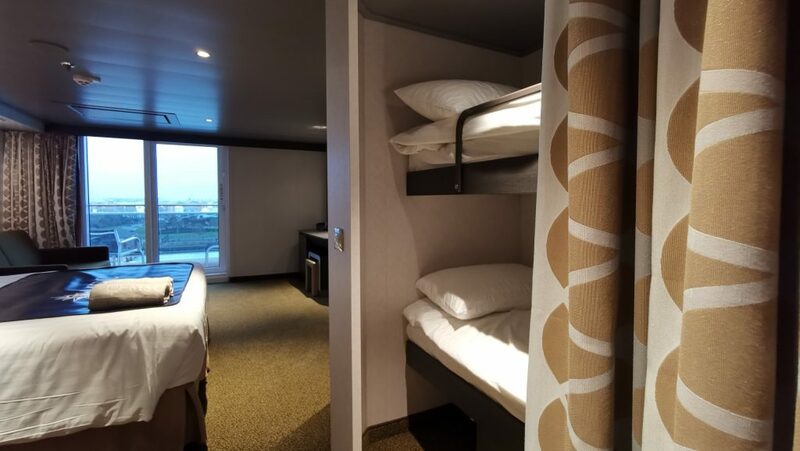 The Studio cabins (Inside and Balcony) onboard MSC Bellissima are the perfect accommodation for solo travellers. 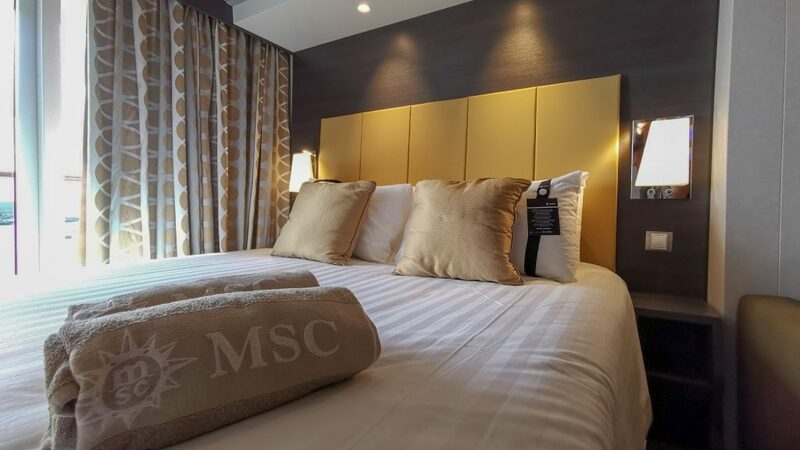 With a surface of approximately 12 m² they offer a comfortable large single bed (140 cm), sufficient storage room, vanity area, a bathroom with large shower, hairdryer, a large interactive flatscreen TV, telephone, safe, minibar and of course ZOE, MSC Cruises’ Virtual Personal Cruise Assistant. 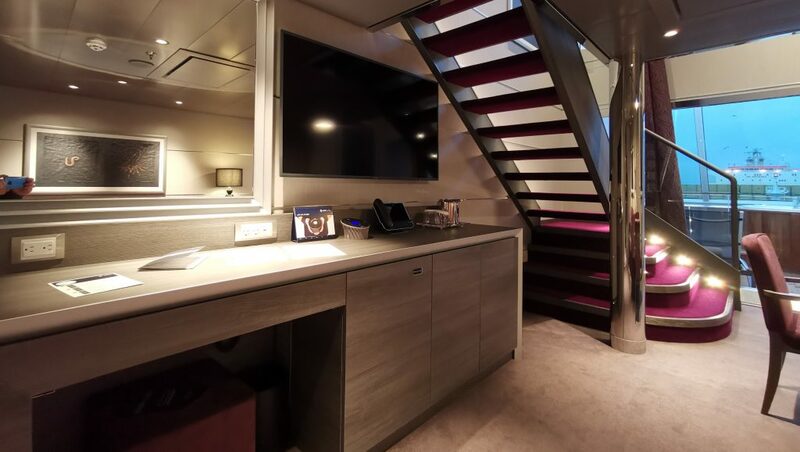 The Inside Staterooms range in surface from approximately 12 to 22 m² and offer a budget friendly way to explore the world. They feature double or single beds, an interactive flatscreen TV, telephone and safe. The bathroom has a large shower and minimal storage space. Personal Cruise Assistant ZOE sits comfortably on the desk above the minibar. We recently stayed in a Balcony Stateroom on deck 11, appropriately named Bellissima deck. Our stateroom had the easiest cabin number ever, 11111. Upon entering our stateroom we were greeted by a luxurious gold and yellow colour scheme combined with a darkbrown deskspace/vanity area and wardrobe. Depending on the type of MSC experience you book – Bella, fantastica, Wellness, Aurea or Yacht Club – staterooms vary in colour scheme. Our stateroom came with all the amenities we love and expect in a modern (hotel)room. These include: a mini-bar, hairdryer, flatscreen TV, telephone, climate control, different pillows, delivery of ice (upon request) and USB charging ports. 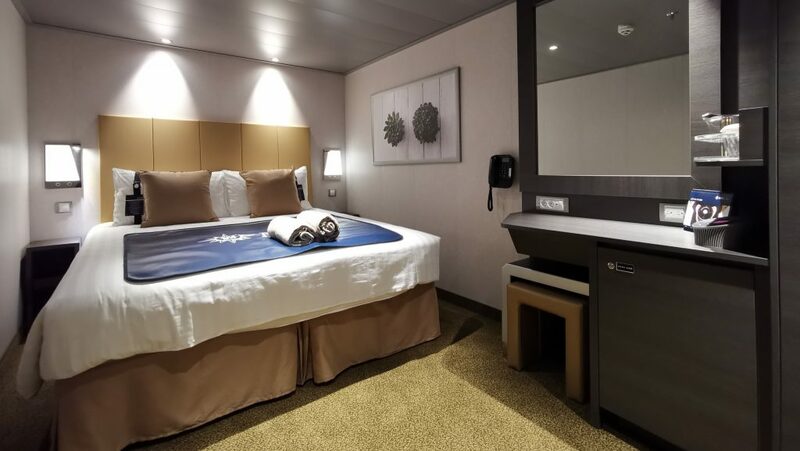 While we were on board MSC Meraviglia for its Naming Ceremony – in June 2017 – we noted that it would be nice if MSC installed more than one USB port in the staterooms. And guess what, MSC Cruises listened. The cruise line has added a USB charging port in the bedside reading lights. But as we personally don’t like to sleep with our mobile phones next to us, we hope MSC will install a few more USB charging ports above the desk. 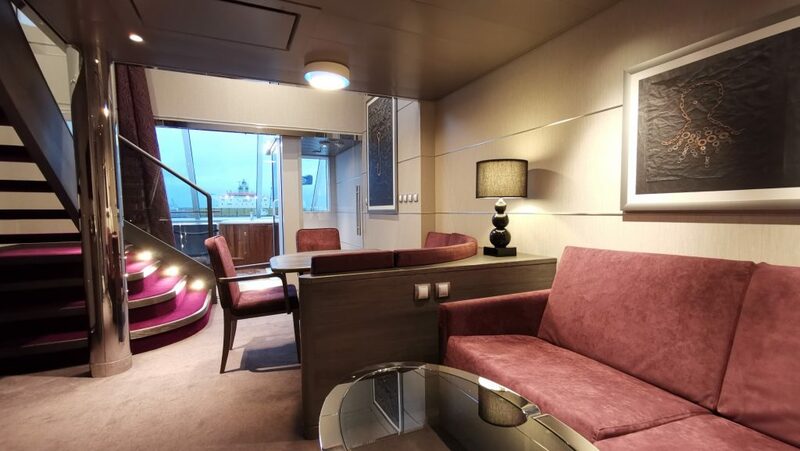 Nevertheless combined with the two European and two American-style power outlets modern day travellers on board MSC Bellissima can charge a total of seven devices at the same time. 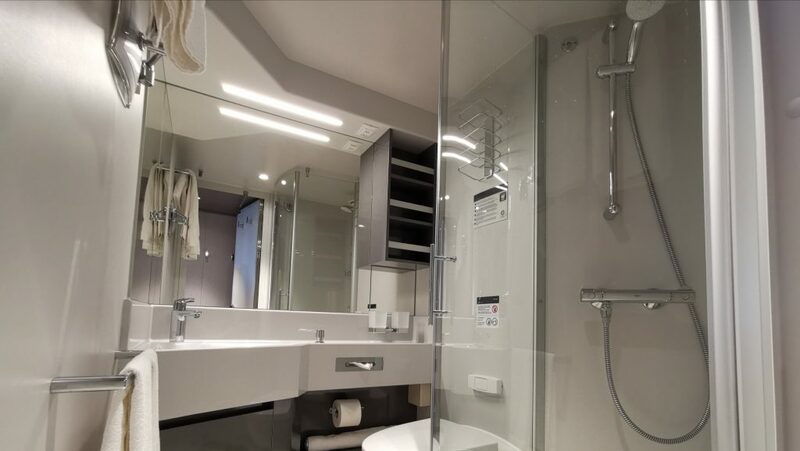 The compact white and grey bathroom in our stateroom offered adequate storage space, a large glass shower and complimentary bath products such as soap, showergel and shampoo but no body lotion and conditioner like on other (Italian) cruise lines. Ocean View and Balcony Staterooms range from approximately 12 to a comfortable 22 m². While we loved the modern design of the cabin we did notice it offered a minimum of storage space. Part from the wardrobe (which holds the safe) and a drawer under the desk (where the hairdryer is stored) there was no space to store personal belongings. For us, travelling as a couple, this didn’t really pose a problem, but we can imagine for a family of four this might be an issue. MSC Cruises is a family owned company and (being Italian) they put a lot of focus on families. To accommodate families and facilitate multi-generational holidays MSC has come up with a clever and unique system of Modular Cabins. Within the modular cabins system up to three, otherwise separately sold, cabins can be combined together. 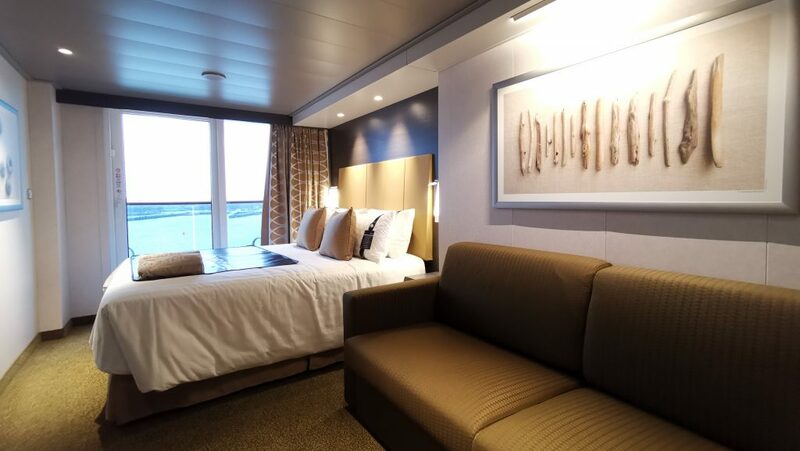 A Family Stateroom can be made of two connecting staterooms, for example one balcony stateroom and one interior room. This combination would mean the family has one balcony and two bathrooms. 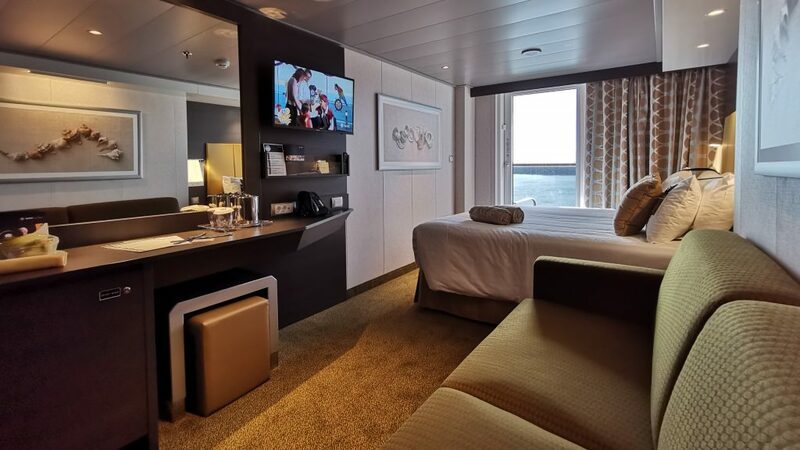 A Super Family Stateroom would consist of two connecting balcony staterooms each with their own bathroom (one equipped with a shower, one equipped with a bathtub). 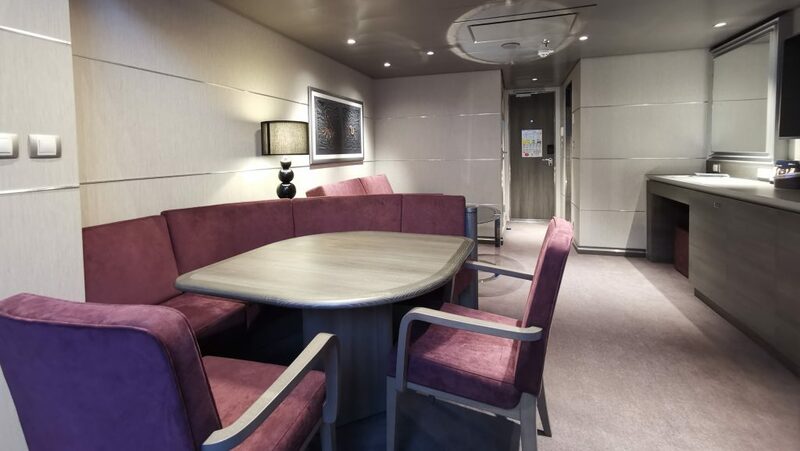 And finally a Super Family Plus Stateroom which comprises three connecting staterooms, two balcony staterooms and one interior room. This combination would include two balconies and three bathrooms and could accomodate up to 10 guests. 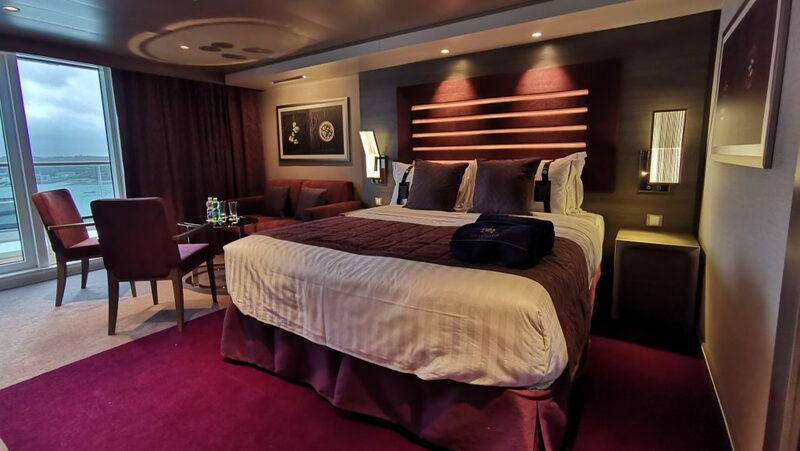 Located at the front corners of the ship the Aurea Suites measure from 27 to 39 m² and offer guests a sitting area with sofa, a separate master bedroom, a spacious wardrobe, a bathroom with shower, vanity areas with hairdryers and a balcony with its own private whirlpool bath. 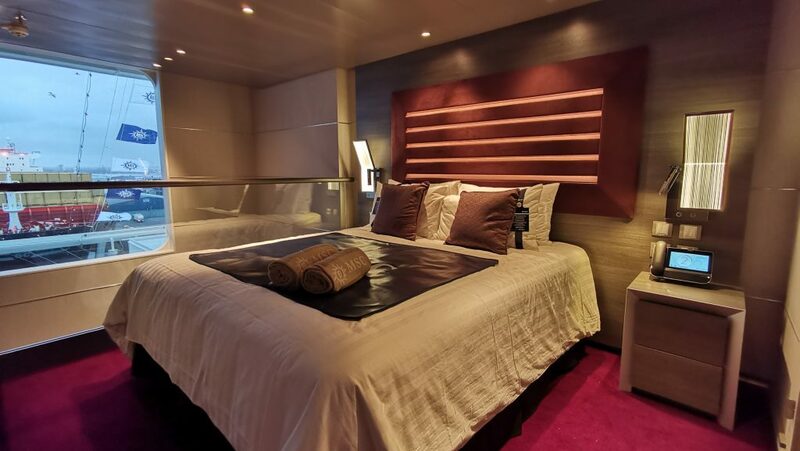 One of our favorite staterooms on Bellissima are the Duplex Suites. 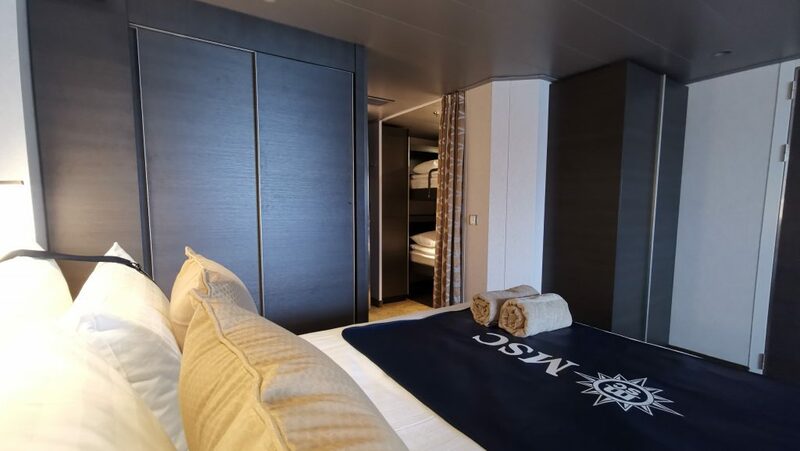 These 59 m² two-deck-high staterooms were first introduced on MSC Meraviglia and feature an open living/dining area with a sofa that converts to a double bed on the main level. On the second level is the master bedroom with queen bed. The Duplex Suites have two walk-in wardrobes and two bathrooms (one with shower on the ground floor and one with a bathtub on the upper floor). 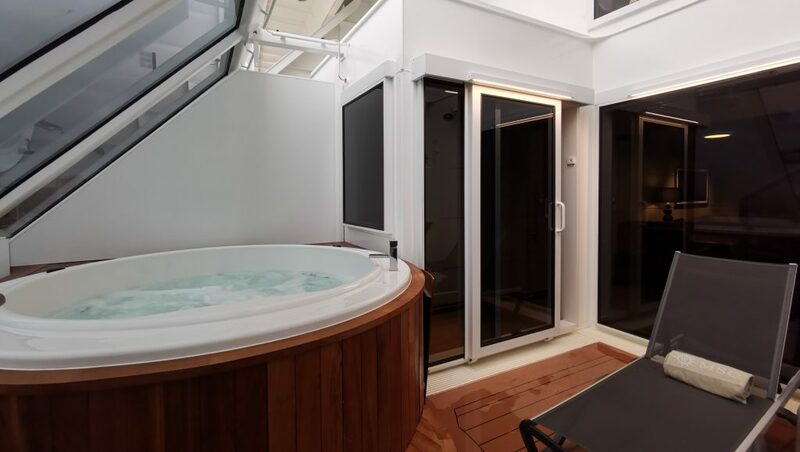 The one thing that makes these Duplex Suites really unique is the balcony with its own private whirlpool bath. 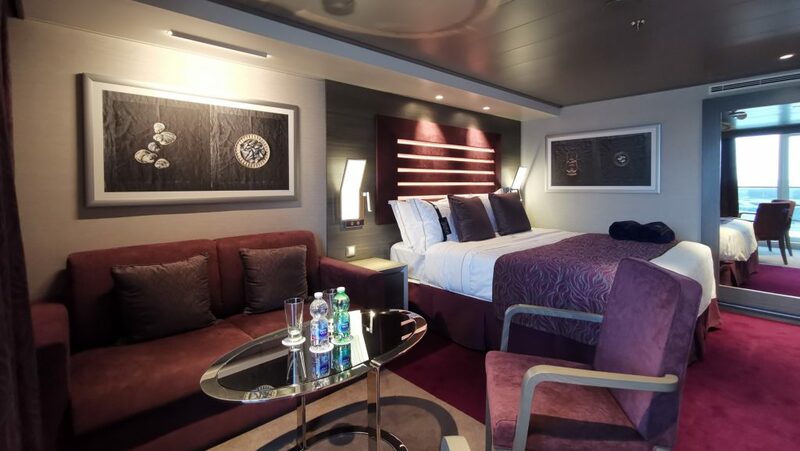 For a closer look at some of the other staterooms onboard MSC Cruises’ ships visit our review of the cabins onboard MSC Splendida. 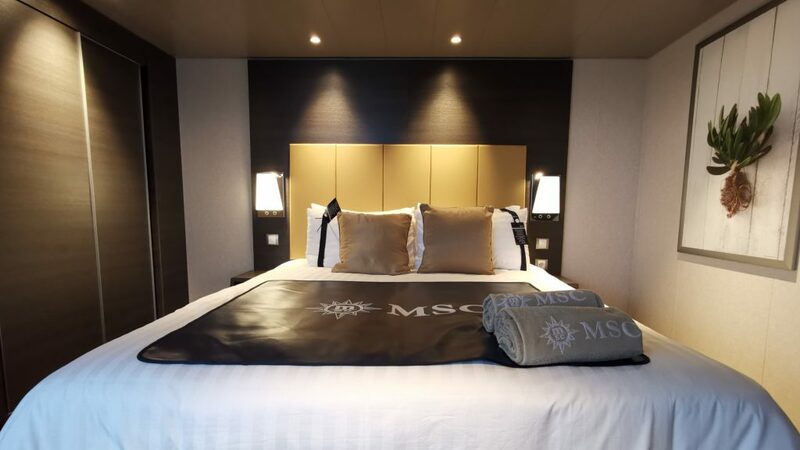 The luxury MSC Yacht Club, an exclusive area for guests demanding the highest standards of luxury, spans three decks and offers 78 suites, 15 inside cabins and two Royal Suites. These include priority check-in and check-out, concierge and butler service, an espresso machine in the room, use of the private MSC Yacht Club restaurant and the private sundeck. Yacht Club guests also get unlimited drinks (by the glass) in all bars and restaurants. The Deluxe Suites in the Yacht Club measure approximately 24-28 m² plus a balcony and benefit from all the above mentioned Yacht Club benefits. Furthermore they feature a sitting area with sofa to watch the interactive TV, a spacious wardrobe and bathroom with shower or bathtub and vanity area with hairdryer. 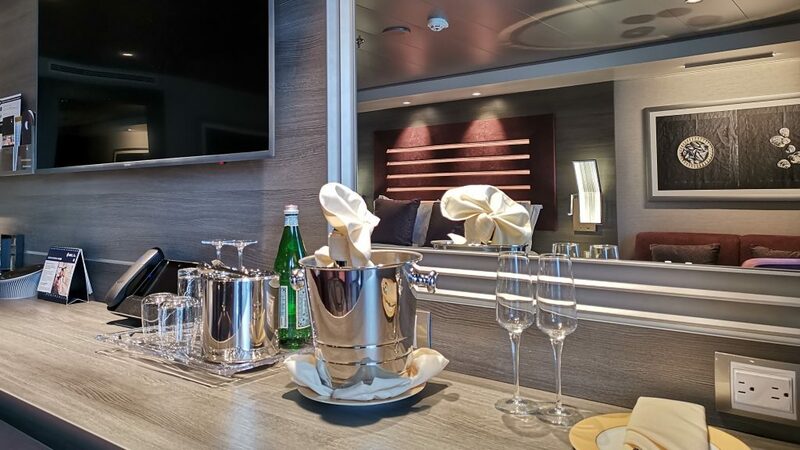 The MSC Yacht Club Royal Suite is the ultimate suite onboard Bellissima. With a surface of approximately 66 m² the Royal Suite offers a separate living area and dining room, walk-in wardrobes and a bathroom with tub and shower, and vanity area with hairdryer. Outside the balcony offers enough room for a private whirlpool bath and dining table. Hi Ricky & Yves, great blog post. I thoroughly enjoyed following you whilst you were onboard Bellissima. The cabins look lovely and you have explained them really well. The Duplex Suites look amazing! Hi Kerrie, Thanks for following us and sending us your feedback. We’re happy we could take you along on our discovery of MSC Bellissima and show you some of the things we like. As we mentioned the Duplex Suites are really amazing (even more impressive than on the pictures) and we’re convinced you would love taking in the views from the whirlpool (with a glass of bubbly! ).